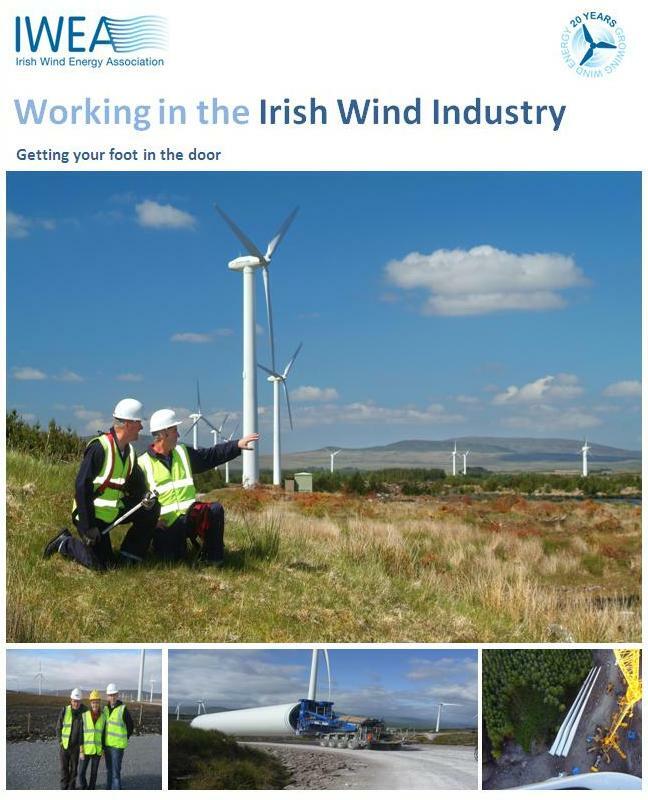 Approximately 2,200 people now work in the Irish wind industry which has a total capacity of 1774MW. 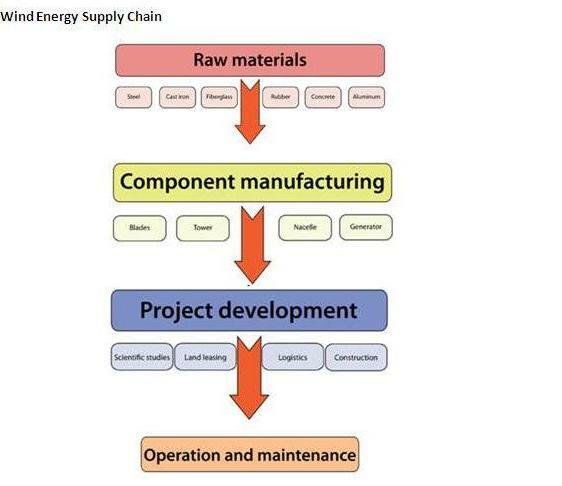 Jobs within the industry can be broken down into separate functional areas ranging from turbine technicians to project managers. To progress and meet the 40% EU electricity target, Ireland will have to build approximately 275MW per year between now and 2020. Delivery of our target will allow Ireland to deliver enough energy to support existing jobs in the sector, as well as to create thousands of new jobs and bring in further investment to support economic recovery. 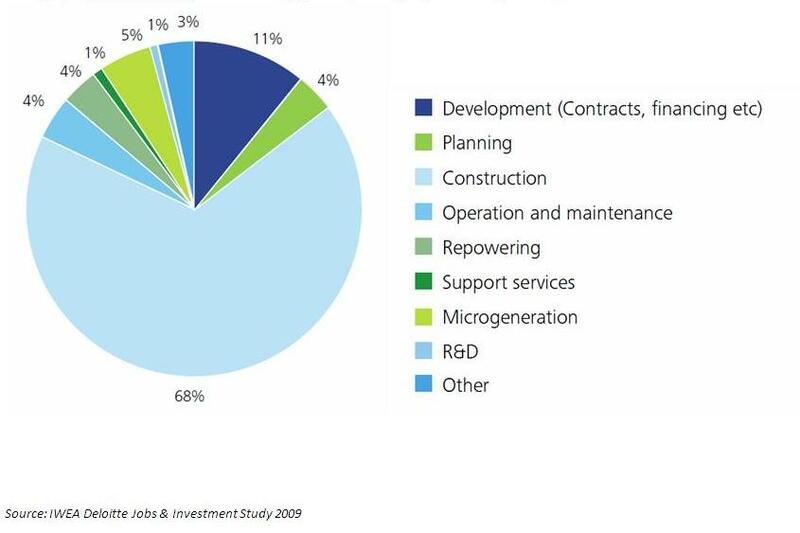 The graph below shows wind energy jobs by category including O&M jobs at 4%. Working as a wind energy operation and maintenance (O&M) technician has become a sought after position in recent years. The major benefit to job hunters is that the sector has grown rapidly since 2005 and will continue to grow in a bid to meet our binding 2020 renewable energy targets. However extensive training is required to understand all aspects of the wind operations and safely carry out the job of a wind turbine technician. It is important to note that there is no magic course that will guarantee you employment. 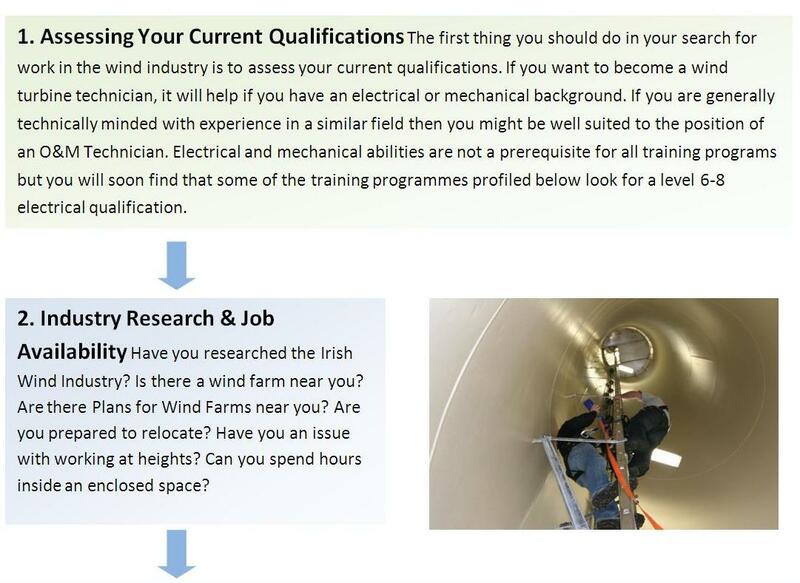 To help job seekers we have set out 7 key steps in becoming a turbine technician below which we hope will help get your foot in the door of the wind industry. 2013 Job Seekers event was held 13th June 2013. For the past two years Wind Skillnet has held the now well renowned training course ‘Unemployed Facilitation Workshop – Entering the Wind Industry as a Turbine Technician’. Wind Skillnet is funded by member companies and The Training Networks Programme, an initiative of Skillnets Ltd, funded from the National Training Fund through the Department of Education and Skills. 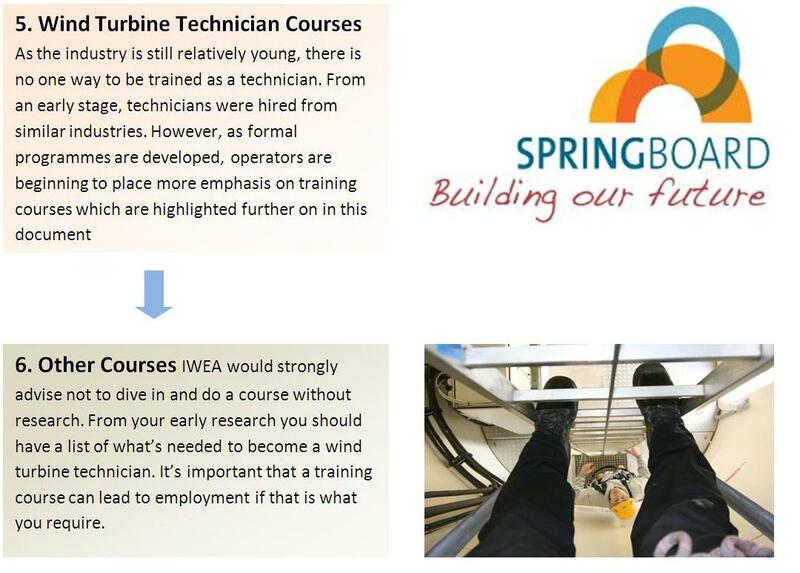 Wind Skillnet will deliver subsidised training in a structured way. Wind Skillnet is based in the IWEA offices, in Naas and is directed by a Steering Group Committee, made up of a cross section of IWEA members. Wind Skillnet is managed by a Network Programme Manager Deborah Murphy. Skillnets is an enterprise-led support body whose mission is to enhance the skills of people in employment in Irish industry to support competitiveness and employability. Skillnets is funded from the National Training Fund. Since 1999, Skillnets has facilitated over 10,000 Irish enterprises, in over 150 networks to improve the range, scope and quality of training and allowed 50,000 employees to improve and meet their skills needs.Wind Skillnet has conducted extensive training needs analysis with its member companies, worked closely with IWEA and taken guidance from leaders in the Irish Wind Industry to develop a suite of courses that will meet the requirements of trainees in the Wind Industry through 2012. The courses cover a range of topics range from turbine operation, maintenance and productivity, finance, planning, grid connection and wind monitoring to name a few. Wind Skillnet is open to course suggestions and will endeavour to meet additional training requirements. 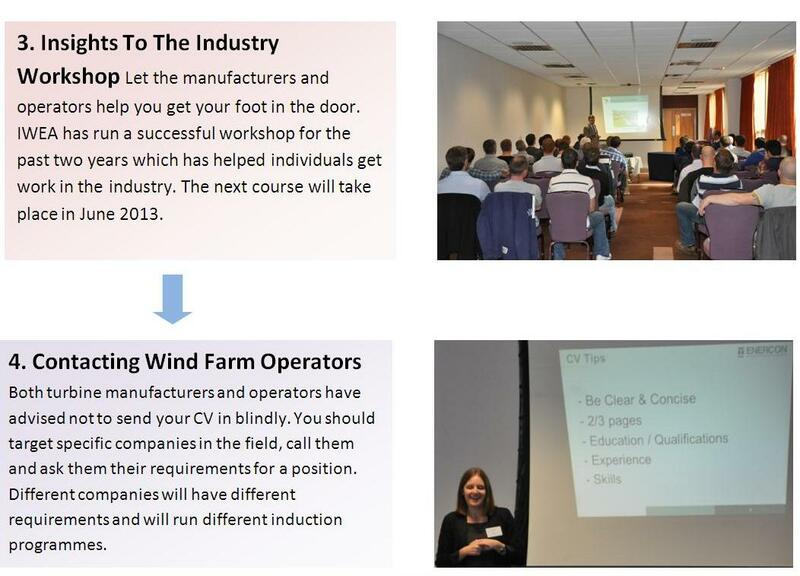 You will know from your contact with wind farm operators on what courses you should aim for along your route into the industry. There are a number of courses open for unemployed applicants to apply. IWEA would advise you to select a program which is orientated toward training wind turbine technicians, and that the course provider is reputable with the required accreditations. These courses will teach the basic skills needed to keep up with routine maintenance on wind turbines as well as the basic safety skills that are needed when working on a wind farm. Twenty eight students graduated from LYIT’s Wind Energy Technology programme in October 2012. Sixteen have found gainful employment or have chosen to go onto further studies. LYIT students had placements as part of their programme with Siemens, Nordex Energy (Irl), Enercon, Nordex (UK), B9 Energy, Ecowind power, Ecopower, The Natural Power Company and Barr na Gaoithe Teo. Many have already started their new careers and have been given a second chance. Pat O’Donnell (now with Siemens) described when he got the offer of employment at 50 years of age having completed the wind energy programme at LYIT was equivalent to winning the lotto. He feared that having been made redundant two years earlier that in these recessionary times he would never have the dignity of working again. “LYIT’s programme gave me the necessary education and skills to go back to the market and be confident in my own abilities and skills and get employment”. Mark Mc Cloat, Field Operations Manager, Nordex Energy Irl, stated "Nordex Energy Ireland Limited and Nordex UK limited are extremely happy to be associated with the Wind Energy Technician Course at Letterkenny IT. The quality of the graduates have been second to none. "So far Nordex have already hired some graduates from the course and strongly intend to do so in the future.